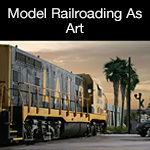 Often we’ll see a thread on a model train forum that asks the question, can model railroading be considered art? This question never fails to deliver a wide range of opinions that will go in circles and often end up back at the original question… can a model railroad actually be considered to be art? 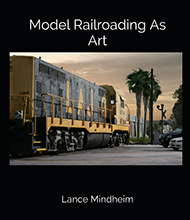 When I saw the new book by Lance Mindheim titled Model Railroading As Art, I immediately ordered it and at the same time, contacted Lance and see if he’d be interested in doing an interview with us here at Raildig. We previously interviewed Lance several years back (here’s that article) and are happy to present our readers with this interview on his most recent book. I was immediately interested when I saw the title of your new book, Model Railroading As Art, after years of seeing this topic on model rail forums. How did this book come about for you? I’ve always been intrigued why certain model railroads really stand out. I wondered what it was about them that set them apart. What was it about them that grabbed me? For years I just couldn’t get a handle on it. 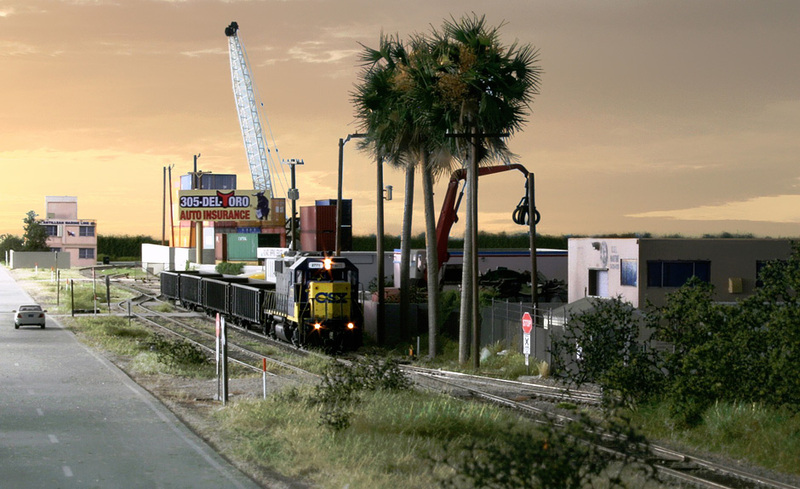 In model railroading, we have a culture where prototypically accuracy is the Holy Grail. I noticed though that a model could be an award winner prototypically and still not stir any more emotion than an architectural model. Over time I realized the effectiveness was coming from color treatment, composition, and the handling of textures, not prototypical accuracy. Once I realized I was dealing with artistic concepts, not modeling ones, the idea for book came together. 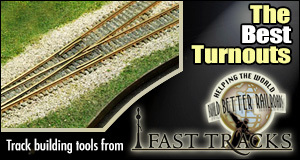 Your previous model railroad books such as “How To Build A Switching Layout”, and “8 Realistic Track Plans For A Small Bedroom” seem more familiar in some ways by addressing the planning and operating of a layout. The new book seems a little more challenging to easily categorize. Well, we all like categorizes and neatly organized boxes for our topics! Model railroading tends to get mired in a culture of looking at things and doing things the same way, much more so than other hobbies. As a consequence its growth has been relatively slow. My hope was to expose readers to other viewpoints by bringing in the vibrancy of other fields where the followers are so passionate, photography, painting, the arts, etc. When this topic does come up, I often hear people say it doesn’t matter if a layout is considered art or not, as long as you enjoy it. 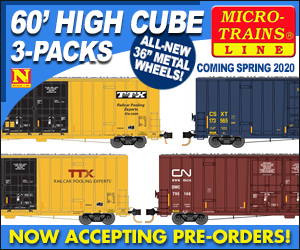 Can we expand our expectations of what a model railroad is, or can be? It’s more a matter of what it “can” be. If we consider the possibility that our work can be enjoyed as art, something that brings enjoyment whether the trains are moving or not, it simply adds a new dimension. Whether somebody wants to enjoy their work that way is a matter of personal choice. I just want to open their minds to the possibility that it’s another option. One of my favorite ideas in the book looks at the difference between art and illustration. I found this a very powerful concept. Can you talk about this art vs. illustration difference? This is a common topic in the art world. The role of an illustration is simply to convey information. Art goes a step beyond to stir emotion. An architectural drawing of a bridge is an illustration. If an acclaimed artist, such as Hopper, were to paint that same bridge, the final result would stir emotion. Effective art is far, far more difficult to create than an illustration. This applies to our work as well. We can have a model of a station that is dimensionally accurate, nail by nail. However, if it’s not effectively weathered it’s basically just an illustration. It won’t have the same emotional impact you get if you were to go into the field and view the actual prototype subject. In the book I wanted to bring home the point that prototypical accuracy alone, while a noble cause, won’t get you to the finish line. There is a step beyond, art, and that’s much harder. 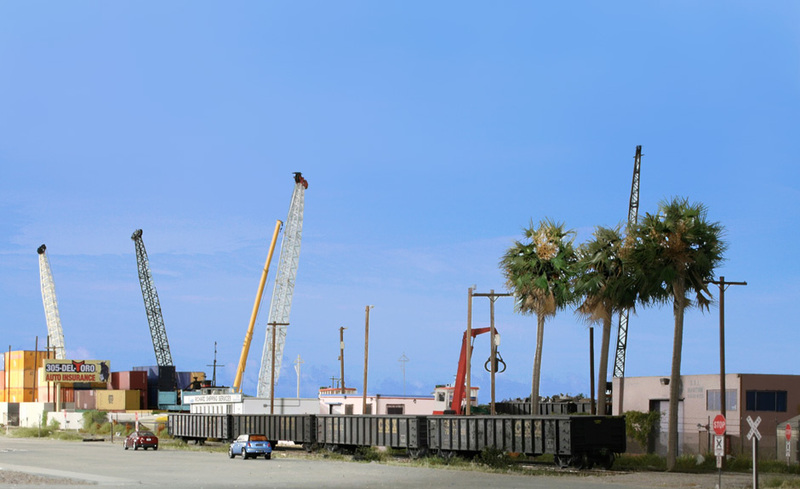 Space: horizontal, vertical and negative are not terms we regularly use, or hear used in model railroading, but it’s an important idea in the book. Why is this? It’s important because scene composition stands side by side with coloring in importance. If we don’t have a basic understanding of the role spacing and composition play, our layouts will look “off”. We may not be aware of why but the largest culprits are spacing elements too closely together and an overly symmetric arrangement of the elements. It takes a lot of self-discipline but if we can space things out, often at the expense of eliminating a structure or two, the overall visual impact improves dramatically. 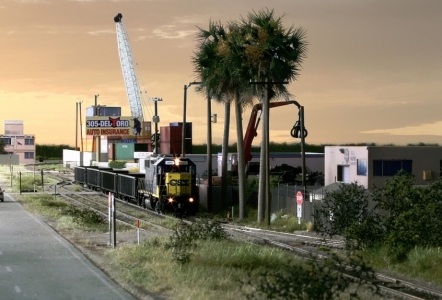 Model railroads face an additional challenge that traditional artists don’t. Our subjects are man made and are often laid out in ninety degree grids. In addition, bench work often needs to be linear. Combining the two, we are frequently locked into an overly symmetrical composition driven by those ninety degree angles. Our ace in the hole is vertical space. 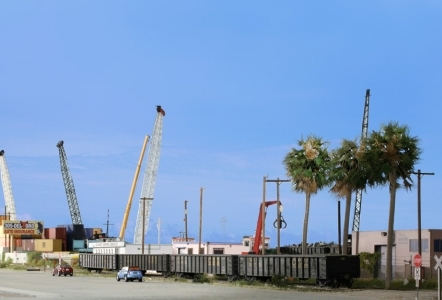 We can use vertical elements such as poles, stacks, trees, etc. to break up the symmetry a little. The way you address color really drew me in and had me thinking about my own color work… and feeling slightly guilty if I’m honest! Why is color so important? This gets to the earlier question of art vs. illustration. I believe what all of us are trying to achieve, whether it rises to the level of conscious thought or not, is to have our model transport us. When we look at a finished model we want to have the same visceral feeling we get as when we look at the actual prototype. The two driving factors to get to that point are effective color treatment and scene composition. Examined closely, the subjects we model have surfaces comprised of fairly complex color patterns. If we can’t represent that, we won’t hit our goal. To get there you need to move from a “paint by numbers” monotone approach to color and think in terms of layers, blends, feathering, and transitions. It’s not easy and takes practice. The first step though is knowing the importance of the issue. “Pick The Message” seems an important idea in the book, can you talk a little bit about what this means? For most of us the ultimate goal is to feel transported. There is something we saw in the field, or an image in our mind that stirs positive emotions. We need to identify what that emotion is before we can represent it in model form. Is it calm melancholy, serene peacefulness, power, the energy of human activity? For each person the goal is different but you need to know the destination before you start the journey. The way a scene is composed can often be a matter of studying the prototype and then freelancing a bit. Can we approach layout composition in a different way? Yes, and it comes down to awareness and mindset. Composition is an area where many modelers struggle. They don’t understand the overwhelming importance of the subject or how to go about it. Also, there is an overriding fear that a layout will be boring if every possible scenic feature on our wish list isn’t somehow sledgehammered into our limited working area. If you make an assembly or coloring mistake on a layout it’s generally easy enough to correct. If the composition is off from the beginning, it’s almost impossible to fix. The biggest composition error? Without question it’s trying to put more elements into a scene than the square footage will support visually. I really like this line from the book, “Learn to see. Ask yourself, “What am I really looking at?”. How does this line apply to building a layout? Prior to writing the book I spent a lot of time reading the biographies of famous artists such as Hopper, Rockwell, etc. The one thing that stood out was how long they studied a scene before painting it. The time was measured in days or, in some cases, weeks. They didn’t just role up, take a quick glance, and then start slapping paint on canvas. When we look at a prototype subject there is something that subconsciously grabs us. We need to get a handle on what that “something” is if we’re to represent it in model form and evoke the same emotion. It’s not easy. Is it the color patterns and weathering of the structure? The complex blends, textures and shapes of the dead grass in front? Before we start to build the model we need to identify where we need to direct our attention or we’ll just end up with a soulless architectural model. You talk about concepts for viewing our model railroads in person, as well as the dynamic nature of photographing our scenes. Are these aspects we don’t give enough time and attention to? Absolutely! This gets back to my audience of one concept. Experiencing our work photographically isn’t about impressing others, it’s about ourselves. It’s a totally selfish pursuit. For those that are willing to dive into photography it opens up an entirely new world in terms of experiencing your work. For reasons I don’t fully understand, there seems to be a lot of apathy, fear, and resistance to the subject within the hobby population. With the quality of modern cell phone camera’s, excellent images can be taken be even a novice. We’re nearly at the end here, and like many of those earlier mentioned forum posts I find myself again asking, is model railroading art? What would you like readers to take away from your book? I think the main takeaway is an understanding of what is specifically going on with a highly effective model that separates it from the pack. If we don’t understand what’s driving the appeal, we can’t develop and employ those techniques ourselves. If the reader understands that the reason what they’re looking at is so compelling visually then they can isolate those areas, focus on them, and improve their abilities in those specific areas. You can’t move forward if you don’t know what you don’t know. Last question, what’s next for you as far as upcoming projects? The larger the surface area of a modeling subject, the more important it is visually. If a tiny pin prick of a detail is off it will likely go unnoticed. If something with a large surface area is botched, it really stands out. One “large surface area” scenic feature is plain old grass and weeds. It’s surprising that given how common it is, how much area it covers, that effectively representing it gets so little attention. Grass scenery products have improved dramatically in recent times but the one, massive, glaring hole, is the absence of earth toned dead grass, the dirty mudding grayish browns. I’ve been doing a lot of R&D lately on using powdered dyes to produce these earth toned grasses. I’ve dialed in the coloring, the next step is to experiment with different application techniques so that when the grass and weeds are placed on the layout they don’t take on an overly uniform appearance.